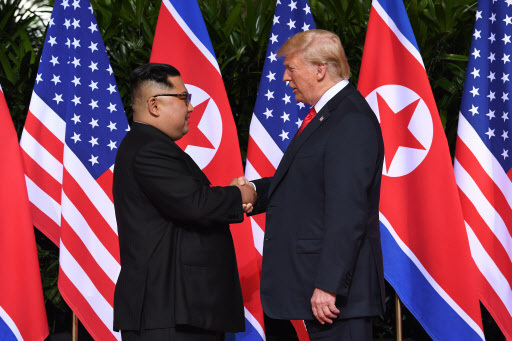 SINGAPORE -- The summit meeting between US President Donald Trump and North Korean leader Kim Jong-un kicked off at about 9:00 a.m. Monday at the Capella Resort, Singapore. Kim entered the conference room at about 8:54 a.m., carrying a folder on his left hand. Trump arrived at the site at 9 a.m. US Secretary of State Mike Pompeo and other officials entered the venue through a different entrance not covered by cameras at about 9:01 a.m.
Trump and Kim are scheduled to hold a short one-on-one meeting, followed by a longer meeting involving their aides. The one-on-one is scheduled to start at 9:15 a.m., and the larger meeting from 10 a.m. A working lunch will follow at 11:30 a.m. The US leader is scheduled to hold a press conference at 4 a.m. It is unclear if the press event will involve Kim. The two leaders arrived in Singapore on Sunday, sparking off speculations of discrete meetings between the two sides at the top level. Publicly, Kim was seen visiting various locations in Singapore on Monday. Working-level officials, however, engaged in last minute negotiations on Monday. US Ambassador to the Philippines Sung Kim, and North Korea’s vice foreign minister Choe Sun-hui are reported to have met three times in Singapore on Monday, continuing their discussions on the inter-Korean border. 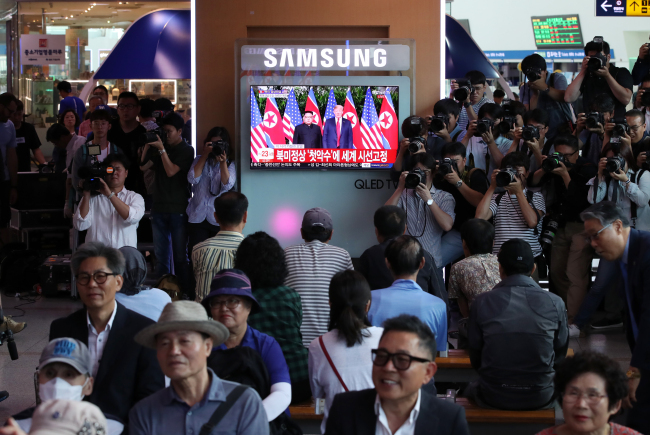 The meeting is being closely monitored by Seoul, with President Moon Jae-in and top government officials watching the live coverage at the weekly Cabinet meeting. Ahead of the meeting, Moon also spoke with Trump over the phone on Monday.